With over 20 years of experience in the rental of cars and vans, we offer the most competitive rates, as well as a variety of categories to choose the best option that best suits your price range and travel needs. 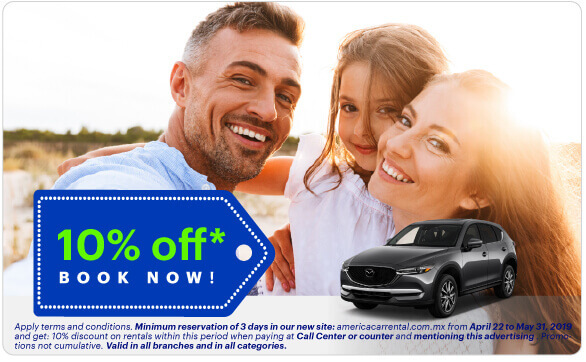 With the brand new cars and vans of America Car Rental you can explore and enjoy Cancun and the beautiful surroundings of the Mexican Caribbean to the fullest: drive from the Mercado 28 downtown to the beautiful beaches of the Hotel Zone, or simply attend an important event at the Cancun Convention Center. For your convenience, we are available 24 hours a day, 365 days a year at our Cancun Airport branch, so that you can easily and quickly rent a car or truck just at the time of your arrival, without worrying about the time of day. America Car Rental will make you experience the best rental in Cancun during your next business trip or vacation to this heavenly destination. This wonderful destination is divided into two main areas: Downtown and The Hotel Zone. 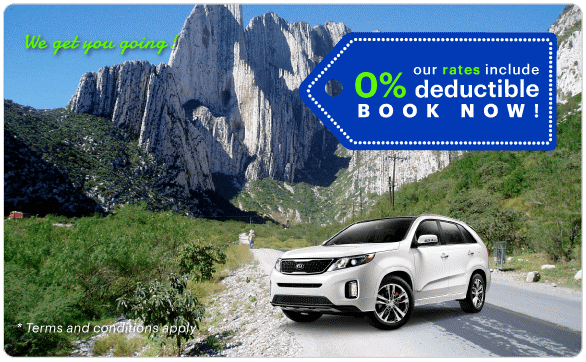 One of the implicit benefits of car rental in Cancun is to enjoy fully and at your own pace all the places of interest and attractions of the City and its surroundings. In the city of Cancun you can drive to Market 28, famous for its crafts; the heart of the city: Av. Tulum; Plaza Malecón Américas; and Puerto Cancun to buy a souvenir of your trip or enjoy delicious seafood in one of the traditional restaurants on the beach in Puerto Juarez. To enjoy the night, is Av. Yaxchilán, the area of the Plaza de Toros and the trendy Av. Nader, full of bars and restaurants. 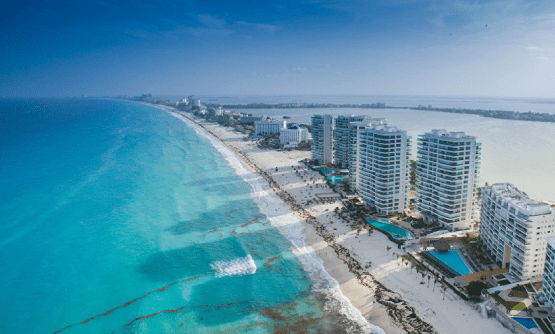 The hotel zone of Cancun is home to dozens of hotels and beautiful beaches along an L-shaped strip of approximately 21 kilometers. Here you will find the convention center, numerous public beaches with white sand like talc, modern shopping centers such as Plaza La Isla and Luxury Avenue with its luxurious shops; the small archaeological site El Rey, located in front of Playa Delfines and famous for its viewpoint. At night, do not forget to visit the vibrant area of bars in Plaza Forum, with the world famous Coco Bongo. of the cenotes, visit Puerto Morelos, visit the botanical garden and the crocodile farm, among many other options. Las Perlas Beach (Blvd. Kukulcán, Km. 2). Playa Tortugas (Blvd. Kukulcán, Km. 6.5). Caracol Beach (Kukulcán Blvd., Km. 8.5). Playa Gaviota Azul (Blvd. Kukulcán, Km. 9.5). Chac Mool Beach (Blvd. Kukulcán, Km. 10). Marlín beach (Kukulcán Blvd., Km. 13). Ballenas Beach (Kukulcán Blvd., Km. 14). Playa Delfines (Blvd. Kukulcán, Km. 17.5). 24-hour service (Cancun Airport branch), 365 days a year. Pick up the car at the airport. Allow us to assist you and offer you a fast and efficient service at our America Car Rental Cancun branches. It is VERY easy to rent a van or rent a car in Cancun! We have the perfect ones for you!